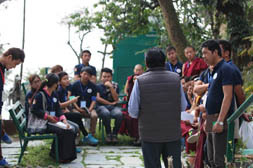 The 10th Tibetan College Students’ Conference took place at College for Higher Tibetan Studies, Sarah in Himachal Pradesh, India, which is very well known to Tibetans and foreigners to study Tibetan language, literature, history, Buddhism, etc. The conference was held for seven days, from 23rd to 29th February 2016, during which, more than twenty different topics relating to status of education in exile were discussed by the participants, who were the representatives of different colleges and Institutes in India and abroad. Searching the thinking direction of leadership and responsibility of the college students to improve the education among exile Tibetans. 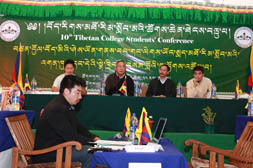 Evaluation of the Tibetan College Students’ Conference. Suggestions/Appeals to submit Central Tibetan Administration and Tibetan Children’s Village Schools. The opening ceremony of the conference started with lightening up of the butter lamp by the Chief guest, Mr. Tsering Samdup, the Education Director of Department of Education followed by other programs including singing of Tibetan national anthem, holding a minute of silence to pay homage to the martyrs who sacrificed their precious lives for the cause of Tibet, related speeches from Chief guests, Special guests, Director of Sarah College as well as president, vice-president and coordinator of the organizing committee respectively. The resolution that discussed for first few days of the conference was about searching the thinking direction of leadership and responsibility of the college students to improve the status of education among exile Tibetans along with question and answer session at the end of each discussions. The fourth day was devoted fully on an educational expedition to Tibetan Parliament in Exile, Cabinet Office/Kashag of Central Tibetan Administration, Library of Tibetan Works and Archives, Norbulingka Institute and Kangra Fort. A special program was also arranged most of the evening from 7:00pm to 9:00pm. 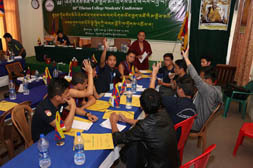 The third sessio n of day five focused on the resolution of evaluating the Tibetan College Students’ Conferences in which the Reviewing Committee of Tibetan College Students answered all the questions regarding the results of resolutions passed in the 9th Tibetan College Students’ Conference. Fourth session of the day had covered on the works of collecting the suggestions produced during 10th Tibetan College Students’ conference and adopting them as resolutions. Day six of the conference started with the talk of Mr. Tsewang Rigzin, Director of Tibetan Foundation on the Difficulties and Opportunities in Exile Tibetan Society followed by talk of Mr. Ngodup Tsering, Minister/Kalon of Education on the Spaces in Tibetan Society which can be filled by Tibetan College Students. The proposals/appeals concerning to Department Education and TCV, were also handed over to the respective heads in the presence of Education Minster/Kalon. Mr. Tsewang Yeshi, President of TCV gave a talk on the topic of “the Present Status of Primary Students’ Education and the Responsibility of College Students”. The participants have also elected new members of Reviewing Committee of Tibetan College Stu dents after deciding the venue for the next conference at the end of day. The last day of the conference concluded with presenting the account reports on income and expenditure of the 10th Tibetan College Students and resolutions/outcomes of the conference. Then Chief guest of the day, Geshe Jamphel Dakpa, Director of Sarah College gave a talk to the students for half an hour and then he handed over the certificates to all the participants. The 10th Tibetan College Students Conference successfully ended with thanking your address by Mr. Yeshi Palden, President of Organizing Committee to all the associated parties on the behalf of the committee members and participants. The Dalai Lama Trust, India provided all the financial assistance to facilitate every requirement for organizing this seven-day conference successfully, including expenditures incurred on every necessities for the conference including meals, accommodation, educational trip, etc. Searching the thinking direction of leadership and responsibility of the college students to improve the education status among exile Tibetans. Evaluating the Tibetan College Students’ Conference. Collecting suggestions to hand over Central Tibetan Administration and Tibetan Children’s Village. Speech on Status of education in exile Tibetans and Responsibilities of College Students by Director of Sambodha School, Mr. Karma Chungdak. How did the management of primary schools uplift the physical and mental development of students? Talk by Education Minister, Mr. Ngodup Tsering on the Spaces in Tibetan Society, which can be filled by the Tibetan College Students. Presenting the resolutions/proposals to be submitted to Department of Education to Education Minister.